Ceratostigma willmottianum growing subshrub to shrub of the genus Ceratostigma also known as Chinese plumbago, Ceratostigma willmottianum perennial evergreen or cold deciduous can grow as annual in colder climates, used as ornamental ground cover drought tolerant plant, can grow in subtropics, mediterranean, desert, temperate, tropics climate or as house plant and growing in hardiness zone 6+. 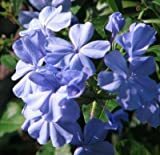 Flower color blue or purple with five petals, the flowers grows in clusters. 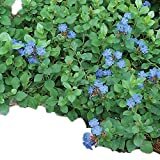 (25 Plants Classic Pint) Ceratostigma plumbaginoides Dwarf Plumbago, Foliage emerges Burgundy, Later Turning to Green Then Turns Bronze in Fall. Blooms are a Rich Blue. (12 Plants Classic Pint) Ceratostigma plumbaginoides Dwarf Plumbago, Foliage emerges Burgundy, Later Turning to Green Then Turns Bronze in Fall. Blooms are a Rich Blue.